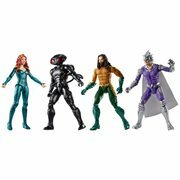 Return to the Kingdom of Atlantis with Aquaman! appearing in comic books from DC Comics and a founding member of the Justice League of America during the Silver Age of Comic Books, following his 1941 debut in More Fun Comics #73. In more modern times, he appeared in the blockbuster films Batman v Superman: Dawn of Justice (2016), Justice League (2017), and 2018's Aquaman with the reluctant hero impressively portrayed by Hawaii-born actor Jason Momoa. 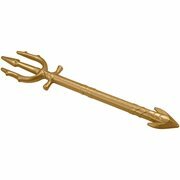 Always fascinating to his many fans, the King of Atlantis has probably never been more popular than he is today. Hence, the treasure trove of must-have statues, busts, plush, T-shirts, mugs, key chains, pins, artwork, mini-figures, vinyl figures, action figures, and more you'll discover below. Check 'em out for a swimmingly good time! Half Atlantean, half human, with superhuman strength and the ability to swim at supersonic speeds, manipulate the ocean tides, and communicate with aquatic life, Arthur Curry is a fictional superhero appearing in comic books from DC Comics and a founding member of the Justice League of America during the Silver Age of Comic Books, following his 1941 debut in More Fun Comics #73. In more modern times, he appeared in the blockbuster films Batman v Superman: Dawn of Justice (2016), Justice League (2017), and 2018's Aquaman with the reluctant hero impressively portrayed by Hawaii-born actor Jason Momoa. Always fascinating to his many fans, the King of Atlantis has probably never been more popular than he is today. 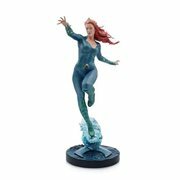 Hence, the treasure trove of must-have statues, busts, plush, T-shirts, mugs, key chains, pins, artwork, mini-figures, vinyl figures, action figures, and more you'll discover below. Check 'em out for a swimmingly good time! So, What's the 2018 Film All About? 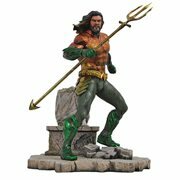 Following the events of Justice League, Arthur Curry, heir to the underwater kingdom of Atlantis, gets caught up in a battle between the surface dwellers that threaten his oceans and his own people, who are ready to lash out and invade the surface. 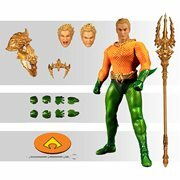 The Aquaman movie stars Jason Momoa in the title role, with Amber Heard as Curry's love interest Mera, Patrick Wilson as his half-brother Orm (who seeks to unite the seven kingdoms against the surface world), Willem Dafoe as Nuidis Vulko, Dolph Lundgren as King Nereus, Nicole Kidman as Queen Atlanna, and Yahya Abdul-Mateen II as David Kane / Black Manta. 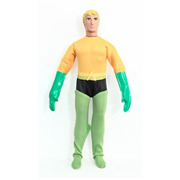 In addition to the comics and films, our hero has been featured in animated form in the 1967 The Superman/Aquaman Hour of Adventure, the Super Friends TV show, the 2000s series Justice League and Justice League Unlimited, and Batman: The Brave and the Bold, plus several DC Universe Animated Original Movies. And there's the live-action television show Smallville. Like we said, Mr. Arthur Curry is one very popular guy!